The third-year students of the Hotel Management Department were taken in a field trip to Radisson Blu Hotel where they attended a training course in the Japanese cuisine. This was held on Thursday 8/3/2018. 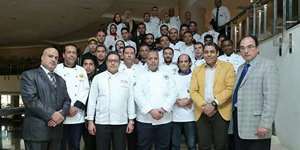 The course was given under the supervision of Alexandria Chefs Association. During the course, the students learned how to make sushi, wasabi sauce and yakimono (grilled or pan-fried dishes), among many other Japanese dishes.